Quick and exact oxygen measuring values by direct in-situ measurements are necessary for optimization of combustion control and emission monitoring. 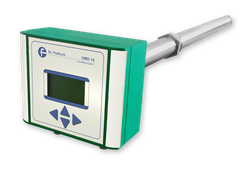 The oxygen analyser of the Dr. Födisch Umweltmesstechnik AG is used for the oxygen concentration measurement in flue and process gases. The oxygen is measured by a zirconium dioxide cell, whereby the concentration of free oxygen is analysed. Based on the proven proportionality of signal and concentration a constant accuracy in all oxygen concentration ranges is ensured.